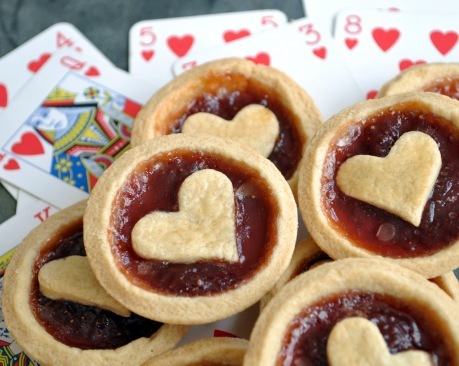 Below are the recipes mentioned on the Alice in Wonderland party page. This recipe is from Zoe at Zoe Makes Cakes. Below is a summarized version (intended as a back up copy should the link be unavailable) but please click on the link above to view the original post with more photos on their site. Check out her blog for lots of cute recipes. She even takes requests! Sift the flour and salt into the bowl. Cut the butter into small cubes and drop them in. With your fingers, rub the butter into the flour. You will end up with a breadcrumb-like consistency. Add the caster sugar and egg yolk and mix to a stiff consistency, using the wooden spoon. You will need to add a little cold water (try a tablespoon at a time) to make it stick together in a lump. Too much water will make it too sticky so add it gradually and work it through, thoroughly. Three tablespoons should be more than enough. Knead the pastry gently for a few minutes, wrap in cling film or foil then leave in the fridge for 15 minutes to rest. Turn on the oven (190C / gas mark 5 / 375F) to pre-heat. Sprinkle a little flour onto the pastry board or work top. Put your lump of dough on it and roll out the dough to about an 5 -10mm thick. Make sure the thickness is even all the way across. Cut out rounds of dough with the circular cutter and place them in the tart tin. Prick the dough a few times with a fork on the bottom and sides. Put a blob of jam into each. When I made these the first time I put in too much jam and it bubbled everywhere. Half a teaspoon is all you need! If you have any dough left over, gather the bits up and roll them out flat again. I chose to make little hearts but you could choose any of the suits, spades, clubs diamonds....or any shape you fancy. Make sure they are small enough to fit on top of the tarts. Place the dough shapes on top of the jam and put them in the top half of the oven for about 20 minutes until golden brown. Leave to cool before eating—the jam gets VERY hot. This recipe is by Nicole at Planning with Kids. Below is a summarized version (intended as a back up copy should the link be unavailable) but please click on the link above to view the original post with more photos on their site. Check out her site for loads of other great ideas for kids too. Mix icing sugar and a small amount of water to make a thick paste like texture. Using a small spoon or knife, spread icing on the smallest end of the marshmallow. 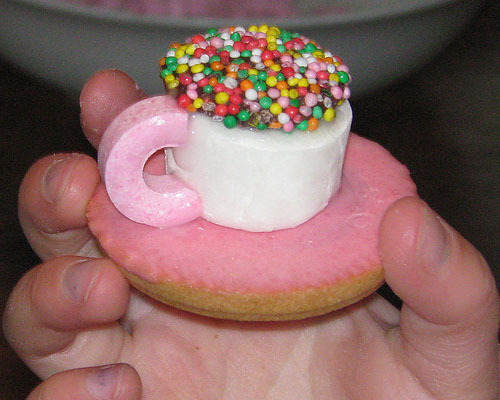 Place marshmallow in the middle of the biscuit and press down lightly. Spread icing on to the flat side of the freckle. Place freckle on top of marshmallow and press lightly. Spread icing on each end of the halved life saver. You then have your finished product! This recipe is from Betty Crocker. Heat oven to 350°F. Grease bottom and sides of one 13x9-inch pan or two 8-inch or 9-inch round pans with shortening; lightly flour. In large bowl, beat granulated sugar, oil and eggs with electric mixer on low speed about 30 seconds or until blended. Add flour, cinnamon, baking soda, 1 teaspoon vanilla and the salt; beat on low speed 1 minute. Stir in carrots and nuts. Pour into pan(s). Bake 13x9-inch pan 40 to 45 minutes, round pans 30 to 35 minutes, or until toothpick inserted in center comes out clean. Cool rectangle in pan on cooling rack. Cool rounds 10 minutes; remove from pans to cooling rack. Cool completely, about 1 hour. In medium bowl, beat cream cheese, butter, milk and vanilla with electric mixer on low speed until smooth. Gradually beat in powdered sugar, 1 cup at a time, on low speed until smooth and spreadable. Frost 13x9-inch cake or fill and frost round layers with frosting. Store in refrigerator. This recipe is by Ree at The Pioneer Woman. Check out her site for lots of great recipes. Just looking at some of the food pictures on her site makes me start drooling! Using a serrated knife, slice the Pound Cake into 1 to 1 1/2 inch slices. 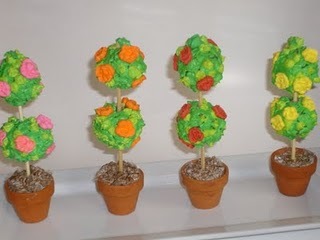 Next, find a biscuit or cookie cutter that fits the bottom of the flower pot, and begin cutting the slices into rounds. Next, just drop each round of cake into each pot, lightly pressing to make sure it's all the way down. 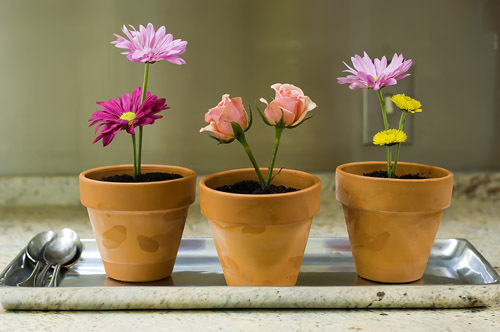 Now find your diminutive flower pots. Make sure they're washed and dried, please. After that, grab your straws. Hold one up against the side of the pot. Then, with scissors, snip it so that it's about 1/2 to 1 inch shorter than the top. Then, just use that as a guide to cut the rest of the straws. 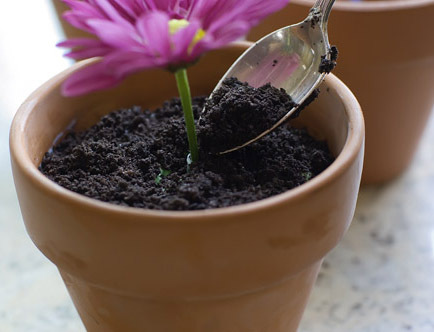 Now, stick a straw into the center of each pot, anchoring it into the cake. Now, grab whatever flavor of ice cream you'd like to use, and either set it out on the counter to soften OR nuke it for 20 seconds or so. It needs to be somewhat soft for this step. Just spoon it into the pot, working it around the straw, until it almost reaches the very tip top of the straw. (Bury some Gummi Worms in the ice cream if you want). Now, as you fill the pots with ice cream, return them to the freezer. You'll want them to refreeze completely and be very firm. Feel free to cover with plastic wrap or foil. While you're waiting for them to freeze, crush the Oreos. Just throw them in a food processor And pulse 'em 'til they resemble a nice, rich topsoil. When you're ready to serve the pots just take one at a time and begin spooning the dirt (crushed Oreos) over the top.Try to cover most of the ice cream. Then take a flower or two and stick the stem into the straw. After you stick in the flower, go ahead and spoon more cookie crumbs up against the top of the straw. 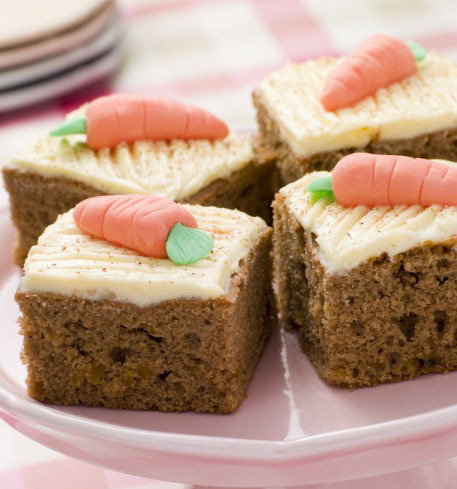 This recipe is from Lisa at The Enchanted Oven, check out her site for lot of other cute recipes. Begin by lining the terra cotta pots with cling wrap. Now pack the krispie treat down inside firmly. It needs to hold up the topiaries, so make sure it is very solid. Trim away the excess cling wrap. Push donut holes onto skewers. You can do one, two, or three if your pot is larger. Here is one I did using a larger pot and three donuts. Now apply green royal icing. I used a darker green with a leaf tip, and a yellow green with a star tip to give it more depth and interest. Just attach hard icing roses and you are done. This recipe is by Lindsay Ann at Dollhouse Bake Shoppe. I really recomend her site if you're looking for some creative dessert recipes. Slice the watermelon into slices about 1/2" thick and punch out as many flowers as you can with your flower cutter. Punch out the centers with your round cutter. Repeat the process with your cantaloupe. Depending on the size of your melon, the center slices may not be wide enough to punch out flowers because of all of the seeds in the middle. A trick I discovered is to slice off the very top and cut 1/2" slices from the top down. This way you can get a whole slice without the seeds getting in the way. Take the centers of the watermelon and place them in the centers of the cantaloupe, and vice versa. Skewer the grape down the stick, followed by the flower. Be careful not to push the stick through the top of the flower. 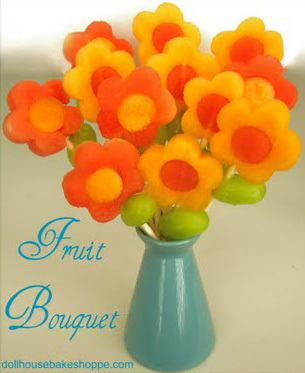 You can even create an edible flower bouquet! 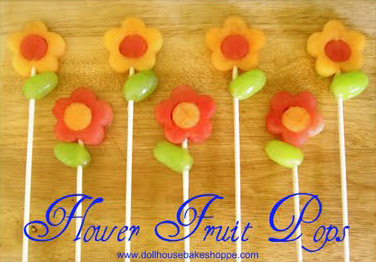 Try using heart and star cutters and incorporating a variety of fruits. Even dip your fruit in chocolate and create your own custom arrangement!